Let it be recorded that at 9:15PM Eastern Time on April 20th, 2009--a new era began in Washington, DC. The Atlanta Braves' Kelly Johnson took a called first strike. A fastball from a young man named Jordan Zimmermann--with two NN's. The much anticipated debut of Our Washington Nationals most appealing young pitching prospect. For six full innings, he was nothing short of spectacular. It didn't matter that this particular game was delayed at the start for 2 hours and 10 minutes. It didn't matter that this particular game would not end before a new day had begun. And it didn't matter that very few were on hand to witness the final three outs of this game. What mattered was that Jordan Zimmermann pitched as crisp and as sharp of a Major League Debut as anyone realistically could have expected. He threw strikes, didn't work from behind. All night long, he challenged The Atlanta Braves hitters. And only made one truly bad pitch. A two strike fastball right down the middle of the plate to Matt Diaz in the top of the 4th inning. A mistake pitch that any veteran hitter is not going miss. Called up to help resurrect a struggling pitching staff, Our New Number 27 left no lingering doubts that he has the talent to be a quality starter. Not many pitch their very first game in The Major Leagues displaying such confidence. When Zimmermann did give up a hit here or that two run homer there--he didn't change his style. Unfazed, Jordan stuck with his game. And in doing so earned some early respect from his new teammates, those few fans on hand watching at Nationals Park--and certainly The Atlanta Braves. Impressive also describes this performance. Pounding the strike zone with his fastball, Jordan used that 95MPH pitch to set up an 88 MPH Slider and one wicked slower curve clocking in the low 80's all night. And when The Atlanta Hitters began to sit on his high speed fastball--Zimmermann went with his off-speed stuff. Getting to J-Zimm at times, The Braves challenged Jordan. But like a veteran of many years on the mound, Zimmermann remained calm--never showing much emotion--not even on Diaz's home run in the top of the 4th. Fortunately for Jordan, his Washington teammates responded to his high energy effort with arguably their finest all-around game of this young season. A few clutch hits, some solid fielding and a bullpen that was able to hold a lead. Yes, Joel Hanrahan closed this one out to record his first save of 2009--before what could not have been more than 100 people when this game, thankfully, ended at 12:12AM on April 21st. 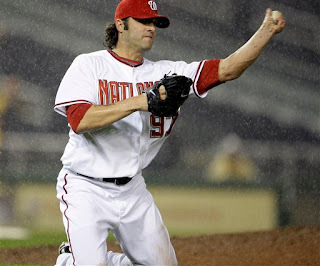 Final Score from rainy and dreary Nationals Park--Our Washington Nationals 3 and The Atlanta Braves 2. Curly "W" Number Two scintillating to watch. Jordan Zimmermann had brought a fresh new outlook with him down from Syracuse this day. And The Bang!! Zoom!! Of The Fireworks!! signaled a new day had truly dawned. Washington's fresh young stud pitcher--that from outset of Spring Training has NEVER BEEN AFRAID to pitch to Big League Hitters--had garnered his very first Major League Win. Not even The Weather Gods could put a damper on the latest Curly "W" Put In The Books. A solid victory that lifted the spirits and helped to wash away the sour taste of the past three final inning losses to The Florida Marlins. No, not many were on hand to witness, officially 12,473 (although realistically just a few hundred), but the diehard fans that lasted throughout this long evening well know, they all saw something special tonight, up close and personal. And his name is Jordan Zimmermann. Hopefully those initials will also stand for No-No's, No Hitters Thrown. Jordan Zimmermann would finish his six strong innings by throwing 51 of his 72 pitches for strikes. He allowed six hits, mostly on fastballs, a few were bloop hits, and he walked only one batter of the 22 he faced. Zimmermann learned a hard lesson on his home run pitch allowed to Diaz. He should have never gone back to his fastball on two consecutive pitches against a dead fastball hitter. Matt Diaz can crush the ball. And he did when Jordan didn't throw his slider or curve--and it cost him--but not the game. J-Zimm becoming the second Nationals Rookie Pitcher to win his debut. Collin Balester also won his last year at Florida. Jeff Francouer becoming Jordan's first strikeout in The Big Leagues. Kip Wells, wearing Number 32, made his Washington Nationals debut this evening as well. 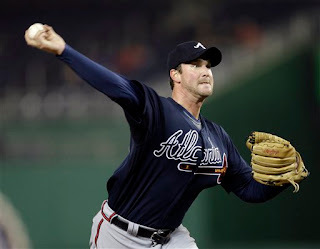 The Journeyman pitcher throwing a scoreless 7th inning and then watched as Our Manager Manny Acta sent the right hander out to the mound for the top of the 8th, only to get Atlanta's Manager Bobby Cox to announce left handed pinch hitter Greg Norton into the game. Once that became fact, Manny simply walked out to mound, called on Joe Beimel, his lefthander of choice and proceeded to get The Braves Manager to waste Norton and replace him with the right handed hitting Martin Prado. It was good baseball by Manny. Especially when Beimel retired both hitters he faced before the rain storms returned. After the latest delay concluded, Garrett Mock, now wearing Number 49, retired the only batter he faced to complete the 8th inning. Joel Hanrahan trotted out for the 9th, looking strong and finished off The Braves in four hitters. His first save of 2009 that completely and finally shut up a small group of Tomahawk Chopping Fans standing behind Atlanta's 3rd Base Dugout. I don't think Derek Lowe has ever struggled so much facing Washington since Baseball returned to DC. On most any given night, Lowe is one of the best sinker ball pitchers in the game. This damp night, he battled the elements all night long. A heroic seven inning 115 pitch performance, but it wasn't vintage Derek Lowe and that allowed Our Washington Nationals to get just enough runs off of him to win this affair for Jordan Zimmermann. Jesus Flores, struggling at the plate over his past six games, broke out with a fine game this evening. If it was not for wet and heavy air knocking the ball down, Our Number 3 would have poked a Grand Slam in the bottom of the 4th. What looked like a SURE THING, but fell just short of The Braves Bullpen--caught by Atlanta's Leftfielder, Diaz--to the absolute surprise of everybody in the park--including The Braves. That stroked ball had Grand Slam written all over it. Flores settled for a sacrifice fly. And eventually knocked the game winning run in the bottom of the 6th on a clean single to left scoring Elijah Dukes who had singled with one out and advanced to 3rd on another single by Josh Willingham. Elijah Dukes would knock in Washington's first run of the evening in the 4th, when he singled on a line drive to Jeff Francouer in right. An rbi hit that plated Nick Johnson who had walked, advanced to second on a Ryan Zimmerman single and advanced to third on a deep fly to left center by Adam Dunn. Eight hits total by Washington this evening--two apiece for Flores and Dukes. Adam Dunn reached base for the 12th straight game this season--that's every single game played in 2009 folks. Our Number 44 leads The National League in On Base Percentage. In the top of the 8th, moments before the final rain delay began--Joe Beimel fielded a bunt for a base hit on the wet turf off the bat of Atlanta's Kelly Johnson. Beimel fell to his knees, but was able to recover and throw Kelly Johnson out at first. An excellent play that was staged up by one wild Defensive Play Of The Game in the top of the 5th. With Atlanta Catcher David Ross on first base via a leadoff walk, Derek Lowe attempted to sacrifice his teammate to second base. Lowe popped up his bunt attempt and Nick Johnson charging in--deked catching the ball and let it hit the grass. Immediately, he turned and tossed the fielded ball to Anderson Hernandez covering first base--retiring Lowe. Hernandez then proceed to get into a rundown with Ross now stuck between first and second bases. But Anderson waited too long to throw the ball to an awaiting Alberto Gonzalez standing on second base--as Ross ran toward his bag. Knowing now that he was in trouble, Hernandez threw the baseball to Gonzalez and promptly hit Ross right in the back of the head, the baseball bouncing off Ross' helmet and over Alberto's outstretched arms and into short left field. Ross, stunned to be hit, over slid the base, and fell toward third. Josh Willingham backing up the play, picked up the errant baseball and hard tossed it to Gonzalez still over second base. Alberto tagging out the surprised David Ross for The Defensive Play Of This Game. It was funny to watch and the entire scenario received a standing ovation from many of those on hand--for the hilarity of it all. Teddy came out totting an umbrella during the 4th inning Presidents Race. To say the least, he didn't win. Abe did, pulling away from George. They fixed the HDTV Scoreboard player positions on the information given for each batter at the plate. Since the first home game, under the name of the player hitting, it read Ryan Zimmerman Third (not base), Elijah Dukes center (not centerfield) or Alberto Gonzalez short. Beginning this evening, the HDTV Scoreboard says Third Base, First Base, Rightfield. Thank you. When the game was delayed for over two hours due to rain, many in The Stars & Stripes Club were lounging while watching The Washington Capitals take on The New York Rangers in New York on Comcast SportsNet. When the game eventually started, not many remained. Finally, after the last rain delay, The African Queen and I had entire sections all to ourselves. Sections 218, 219, 220 and 221 became Prime Time Foul Ball Retrieving Zones. Of course, not a single baseball was sent our way. Too bad, because there was no competition. There were so few people on hand at the end, there is no doubt, every single player in the infield and in the dugout could hear Sohna cheering--probably even the outfielders. That first pitch from Zimmermannnnnnn to Kelly Johnson looks ALMOST identical to the first pitch from Perez to Johnson on opening night. Even ahve the faded opening logos on the bases. What number was Garrett Mock last night? Julian Tavarez is now wearing his old number 50, so I was just curioius. I went to bed after the 8th inning rain delay and did not get to see him pitch. Great Win last night. My friends and family were calling me around 9 for the 1st pitch saying, FINALLY, we have been waiting to see our new Zim all day! Well there was Jeff Zimmerman who last played in 2001 so being a Zim isn't rare but 2 Zim's on 1 team? That is super rare. Maybe Elias Sports Bureau can give us the stats on that!!! Going by the embroidery on Ryan's batting gloves and sometimes on his cleats, he was smart to add 11 after the ZIM so ZIM27 doesn't grab his Under Armour batting gloves. Congrats to a great team effort!!! 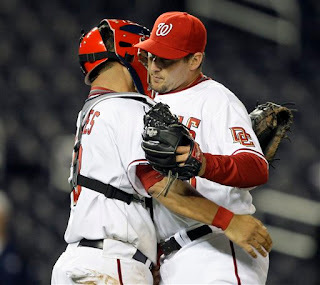 Jordan Zimmermann is just what the team needs, a calm, unflappable, solid pitcher, AND he can bunt! Great family as well, we had a wonderful time in the rain delay with the Wisconsinites. When you look up the word(s) die-hard in the dictionary, it should have your pictures. I have decided to cancel my season's tickets for next year. The last straw? My wife got yelled at by one of the food workers at the carving station in the Stars & Stripes Club on Sunday because my wife was interrupting her profanity laced conversation with a co-worker. Of course she had no name badge so we couldn't turn her in and I doubt it would do any good. Despite all their PR to the contrary Kasten and the Lerners could care LESS about customer service. This isn't about the crummy product on the field, it is about treating your best customers with even a basic sense of respect. I know you guys have a relationship with Kasten so you might want to pass this little story along to him so he knows what a fine job Levy Restaurants are doing. And he has lost a season's ticket holder from 2004 as a result! I also want to comment on the Elijah Dukes story in today's Post. We all know about Elijah's checkered past. However, here is a guy who you can tell is trying hard to turn his life around. And who better to talk to kids about sticking to it than someone who is trying to learn from his own mistakes. So what does Acta do? Fine the guy for being 5 minutes late! Yeah, "rules are rules," "gotta treat all the players the same," let's reel off all the tired sports cliches you can Manny. And who cares whether Elijah didn't set this up through the team so the Nats could get the PR value out of it. Funny when his little Met Pet Milledge was late Manny refused to bench him even though Kasten and Rizzo practically ordered him too. What about the same rules applying to Milledge, Manny? VCUAlumKyle: Mock now wears jersey Number 49, which was the number Daniel Cabrera was originally assigned in Washington. Then Daniel traded Number 49 with Collin Balester for Number 40. Then Cabrera switched to 45 and Balester was sent down. Tavarez was 55 when picked up by Washington but had seniority over Mock for Number 50 once Garrett was optioned to AAA Syracuse. It was also strange seeing anyone other than Chad Cordero wear 32. Kip Wells has that number now. 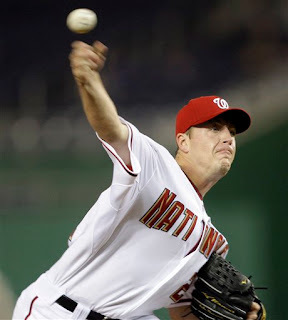 Jordan Zimmermann's Number 27 has only been worn two other times for Washington in The Majors. Zach Day in 2006 and Bullpen Coach Rick Aponte in 2007 & 2008. Although in Spring Training until he was let go this spring, Jose Rijo also wore Number 27. "Funny when his little Met Pet Milledge was late Manny refused to bench him even though Kasten and Rizzo practically ordered him too. What about the same rules applying to Milledge, Manny?" Milledge was late on a game day last season - twice, IIRC - and was sat down both times for violating the rule about being late. When he was late this year, it wasn't to a game but instead to an off-day workout. I don't know the intricacies of Manny's rules, but clearly that is a different situation than being late to a game. Apparently the rule is different there, or perhaps there wasn't even a rule in place for that because they so rarely have off-day workouts. It's certainly not unfair to have an ad hoc punishment in such a situation, and Milledge was punished by being fined. As for Dukes, he should have been aware of what the punishment was for being late to a game because he was late once last year and paid the price then. "Although in Spring Training until he was let go this spring, Jose Rijo also wore Number 27." Do you guys realize that if Hanrahan had gotten his job done against Florida last weekend and they had a good pitching performance on opening day they would be .500 now. No one would be complaining. There are bigger things to worry about in life than a baseball game. Enjoy it for what it is, a distraction. Good to see you and the African Queen last night. Lexi wanted to stay past the 4th, but it just got to be too late for her with school in the morning. She would have loved patrolling for foul balls with you in an empty club section. NatsGuy: We actually had that same conversation with Sam R and his daughter Lexi last night during the rain delay before the game in Stars & Stripes Club. If our bullpen hadn't faltered so poorly, it's reasonable to suggest a .500 record so far this year. No, you can't take it back, it's happened, but everything is not as dire as believed. I thought I heard TAQ when I was watching the bottom of the 8th after the rain delay... but I wasn't sure. Either way, I figured you guys would be there the whole way! Good show of dedication! Actually, there were so few people at the end that I called out, not to loudly, to an usher we know that was standing inside Presidents Club. From Section 218, he heard me right away and we actually had a back and forth conversation--not evening yelling to be heard. Funny. When we got home I watched till the grand ending. During the broadcast towards the end Rob Dibble made an interesting comment that for the opposing pitcher it is much harder with very small vociferous crowd because you hear each and every jeer plainly as opposed to when there are 20K + folks making a noise that equates to just a hum. You could hear every jeer on TV it was great! Just think if you had to wait 33 years for a team. Now thats something to complain about. I would rather see a bad team grow than none at all. If they had been real good from the start we would have taken everything for granted. NatsGuy: Well documented throughout Nats320 (check the archives under Washington Senators/Frank Howard) I did wait 33 years, it's why Sohna and I are more patient than others have shown. Born and raised in Alexandria, Virginia. Diehard Washington Senators and Frank Howard Fan. The Senators moved to Arlington, Texas when I was 12 years old. Any truth to the rumor that Beimel injured his leg and will be headed to the DL? Andrew Lang: See updated post. and GO JZ! was great to see him do so well last night against the evil braves! Just think if you had to wait 33 years for a team. Now thats something to complain about. I would rather see a bad team grow than none at all. If they had been real good from the start we would have taken everything for granted.I was too young to see the Senators when they were here (I was born in '68), but I was writing letters to Peter Ueberroth. I stopped going to Orioles games (unlike other fans in the area) once Peter Angelos (unlike his predecessors) publicly opposed the return of major league baseball to D.C. The way I see it, it's my duty to support this team now that it's here. I have a ticket for tonight's game, but I will be unable to attend since I will be meeting friends coming in from out-of-town who are mourning the sudden death of a poster on a message board we frequent. But I'll see about going tomorrow night. When we have a team become the Twins and another become the Rangers and then nothing for 33 years I'm willing to be patient. We know what it's like to have a team become the Twins and another become the Rangers and zippo for 33 years. We are patient people. Keep up the good work. As an indication that the baseball gods do not like it when you leave before the final out, after reluctantly heading out at the top of the 7th, our Nats express driver got lost on the way back to RFK. Fortunately the guy in front of me was familiar with the area and guided her back through town. One good side - the delay did get me free parking in Vienna when we finally got to my car! Lesson - go the distance.